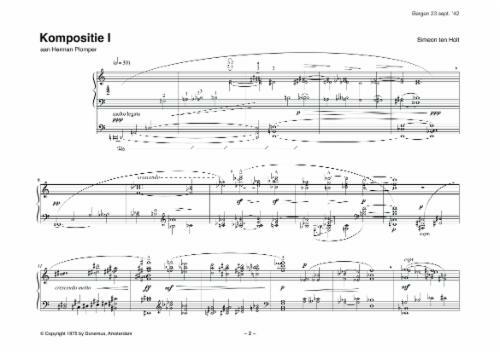 Amidst the turmoil of the war Kompositie I was created from a strong susceptibility to the structural format of stage I and under the influence of a conversation with the poet Jaap van Domselaer (1923-1944) and the composer Nico Schuyt. This conversation was focussed on mystical suggestion and on the philosophy of the composition in Proeven van Stijlkunst (1916) by the composer Jacob van Domselaer (1890-1960). This meant that the vertical does not take part in the general progress. It just reworks the progress. It meant that where the vertical element is veiled, rhythm will be highlighted. It meant the pulse of silence, eternity and conquering rhythm regarding measures of time division. It mainly meant to us ‘our’ susceptibility to the suggestive higher reality, that eternity and the specific sentiment of a centre focussed relation structure. The sentiment of the renunciation of the world in optima forma. 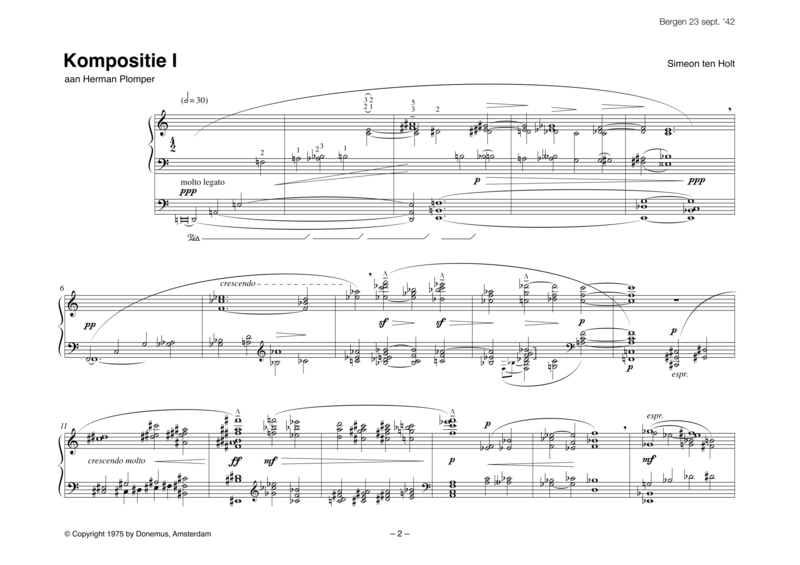 Even more consistently than the pieces of Van Domselaer, who is said to have been the model for this phenomenon, Kompositie I takes place in an extension of tones and in more or less complex chords (verticality). The movement of these complex chords, the ‘going on’ (horizontality), is determined by the ‘standing’ under full control. Although the tonal element is veiled by chromatic discolouring as a result of the piling of tones, the centre focussed, functional structure of the tonality cannot be denied. Only the limits between major and minor fade. In the works of Mondriaan, whose philosophy shows similarity in places, the concept of the tight straight line and the complete balance of the vertical and the horizontal, led to the concept of the mutual relations in the field of social justice. This concept, founded in the present and arising from a relations structure focussed on the object, had certain consequences regarding the attitude to life and was not going to be changed. With us the rhythm of alternating measures of time in strict proportions was mainly literature, a profound externality. The thought of the proportion of the vertical and the horizontal had been weakened by the tonal conditioning and the centre focussed relation structure. Without real grounding in the present, in liberated creativity, the experiment would and could not have any consequences.